When was the last time you’ve been to the doctor? Twice a year I take advantage of the free health screening my very expensive insurance provider covers. I sit in a pale waiting room, quickly flipping through outdated magazines and question every poor health choice I’ve made while I wait for my name to be called. Maybe I ate one too many tacos on Tuesday? Maybe I should have skipped the cookies last Thursday? Once called, I pressure my doctor to check all my vitals, lab work, weight loss only, (yes, weight loss instead of weight gain because who needs that type of negativity) and blood pressure. I wait nervously for the next 3-5 days for the results to return and give me a summary of my current health status. Knowing your current health status provides comfort when the results show that you are healthy, and it allows you to discuss any possible health risk that you are facing and time to make the necessary changes. Like a physical health checkup, a financial checkup is just as necessary and beneficial. How often are you reviewing your financial health status? 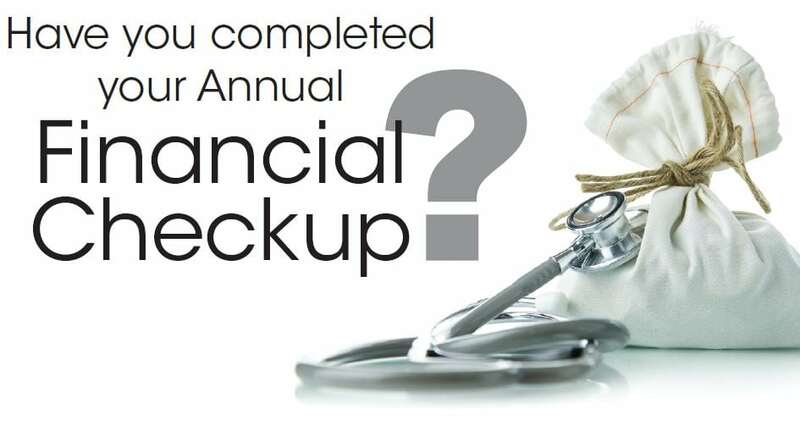 A financial checkup provides a summary of your current financial status. Your financial status includes a full review of your income and assets—current and future debts—any major financial changes such as job loss—the purchase of a home or car—paid off loans—and any negative collections. Depending on the diagnosis of your financial checkup, you will find the remedy to your financial recovery by “writing your prescription,” which will be your financial plan to help reduce the risk of or completely resolve a financial health scare. 1. Examine your current finances. Review your most recent bank statements, pay stubs and/or benefit statements to develop a strong knowledge of the income that you bring in. Are you noticing any major changes or patterns that concern you? 2. Review your credit history and score. Check for any incorrect information or collection items. How are you currently handling past due collections and debts? 3. Consider your spending and saving habits. Are you aware of your spending triggers? Are you an emotional spender? Are you saving with a purpose and a plan? 4. Review your current budget. If you do not have a monthly household budget—create one. 5. Consult with a professional. A professional financial consultant will be able to point out positive and negatives habits and patterns that could be affecting your financial health. One of the smartest things you can do for yourself and your finances is to periodically check your financial health status with the same urgency that you check your health status. The good thing about this financial checkup is that unlike the physical checkup – it doesn’t hurt, and you get immediate results. Your financial growth depends on it! Be sure to follow me on Instagram @thebrokeblackgirl for more tips and information.